Debut Services selected Premier Modular as their supply chain partner to work alongside them on the expansion project at RAF Coningsby, which is part of the MOD’s project SLAM (Single Living Accommodation Modernisation) initiative to provide accommodation on Military bases across the country. 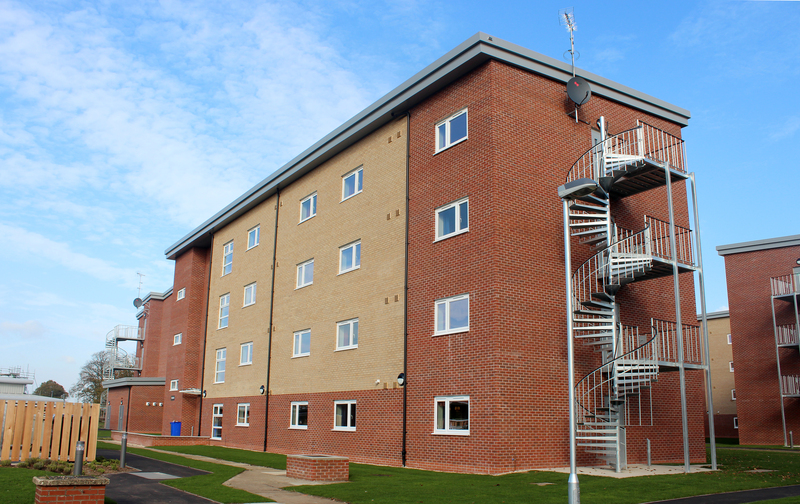 Premier were contracted to provide the modules for three 4-storey accommodation blocks to house Senior Non Commissioned Officers and Junior Ranks at the RAF base. The modular buildings, constructed from 303 modules in total, comprise 231 bed spaces with one SNCO block housing 104 officers and two Junior Ranks blocks accommodating 63 and 64 personnel respectively. The modules were constructed with light gauge steel frames, whilst the core areas were of a beam and post construction. Windows were installed and the bathroom units were fully fitted out whilst still at Premier’s premises. The modules were taped, filled and decorated, with floorings fitted where possible before delivery. As part of Premier’s risk management strategy to reduce health and safety risks, Premier developed an innovative and improved lifting frame, based on an existing solution already in use, which allows operatives to work with optimum safety at height when installing modular buildings. Debut Services have recognised the potential of this improved system and circulated it to the global Lend Lease community, where the system was highly commended by their European Health and Safety Manager. Premier Modular was delighted to successfully achieve a defect free handover at RAF Coningsby. "Thank you to all involved, there’s far too many to name. To follow and build the 3 blocks on a very tight restrictive site is quite an accolade to all involved, which clearly demonstrates collaboration and communication from all stakeholders. Thanks again - another great result!"